This spotlight follows the same line as some of the other 2-in-1 outdoor lights we have reviewed. The URPOWER Solar Spotlight currently holds a 4.4 star rating on Amazon, as well as a badge for #1 Best Seller in the Landscape Path Lights category. Let'd dive right into these lights, shall we? The URPOWER solar spotlight is a good quality light for outdoor use. It features a nice, compact design, sizing at 29 x 9.5 x 34 cm. Which is about the size that we expected to see from a 2-in-1 design spotlight. Small enough to be mounted on a wall, yet sturdy enough for ground use. This device features 4 LEDs, each giving 50 lumens for a total of 200 lumens. 200 is a great brightness, as it is able to adequately light up any given space. That coupled with a pretty big 18650 lithium rechargable battery that has a capacity of 2200mAh, means you probably will not run out of light halfway through the night. The company quotes the active running time as between 6 and 9 hours, which pretty good. Of course, if you have it on it's lowest setting, it will probably last much longer. And of, course it depends on how much sunlight was available the day before. The light head is also adjustable, allowing for more creativity. Unfortunately there is actually no information about the solar panels. However, if this one follows the trend of other solar spotlights, it is probably a polycrystalline solar cell made from PET material. But that is just taking information from similar products. This device could have something very different. The company does not provide the information. What's more is that the solar panel can be adjusted in an 180 degree range. So you can easily move it to better absorb sunlight during the day. While the outer body is lightweight, it is completely weather resistant. It is made out of plastic and has a waterproof rating of IP64. So through rain or snow, this light will work just fine. However, the lightweight build can be vulnerable to damage. So if it is placed in the ground, just be careful that you do not accidentally kick it. If it is mounted on the wall, be sure that it is securely screwed into the wall. The URPOWER solar spotlight's biggest selling point is that fact that it is both a wall mounted spotlight and a ground spotlight. You can remove the stake and use the included screws to fasten it to whatever wall you want. This allows for greater creativity and options for your outdoor area. In addition, the light also features two brightness modes, high and low. However, it is always at the same lighting setting which is auto on/off at night and sunrise. But the ability to have it emit a dimmer light makes for a nice accent if you place them along a pathway, as the full 200 lumen can be very bright. This specific solar spotlight is actually the 3rd generation of the same model. Several changes have been made over the years to this light. the original light had a much smaller light head and solar panel. In addition, the ground stake had the ability to swivel. However, by customer complaints or creative input from the company, the 3rd generation made the solar panel slightly larger, along with the light head. This allows for better absorption rate and more light to be emitted. Also, the ground stake is now a crossed style instead of a circle style. This restricts the light from rotating in any direction. Also, the material is now made out of anti-rust plastic and metal, unlike previous models. Looks like they made some serious improvements to this device. The URPOWER solar spotlight has a great compact design. Allowing it to work both as a ground light and a wall mounted light. 4 LEDs putting out 50 lumens each make for a very bright 200 lumen total output. Easily able to light up whatever area you put it in. If you do not need brightness, fear not. These lights have a dim setting that allows them to put out a much softer light. Perfect for placing along a pathway, driveway or by your garden. The battery has a huge 2200mAh capacity that allows it to last throughout the night on only 4-6 hours of solar charge. You will not have to worry about losing any light. Both the solar panel and the light head are able to be adjusted. This allows for more creative options when throwing light and better absorption possibilities. The body has a waterproof rating of IP64. So through rain, snow, or otherwise, this light will function normally. The lightweight design does make it vulnerable to fall damage or shock damage. So just exercise caution when mounting it on a wall. There was no information provided about the quality of the solar panel. But from what users have reported, it functions just like any other solar spotlight we have reviewed. Some users have reported faulty units. And with no warranty stated, this may pose to be a bigger problem. As I said before, the URPOWER solar spotlights follow the same line as other 2-in-1 spotlights we have seen. Great battery capacity, bright light, weatherproof design. However, with no information provided about the solar cell, there is no way of knowing how efficient it is. Nevertheless, if it continues its trend of following along with other solar spotlights, the solar cell should be perfectly fine. Overall, the URPOWER solar spotlight is a great quality outdoor light. Whether you need it to light up a pathway or place on your wall, it has got you covered. As long as you exercise caution with them and secure them, you should be fine. Right now, you can find them on Amazon for $25.99. What's more is that you get two lights with every purchase, making acquiring a bunch of them easy and relatively cheap. For more information on the other top 10 best outdoor solar lights, check out Green and Growing. 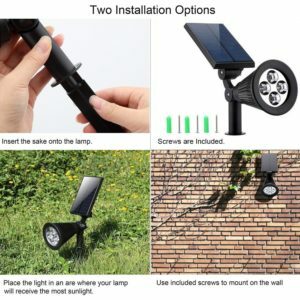 Here are some top questions that I found for people seriously considering buying the URPOWER Solar Spotlight. Will the lights turn off automatically? Yes, they turn on at night and off at sunrise, all by themselves. What kind of light do these emit? That depends on which version you buy. There is a multi-colored light, warm white, and bluish white to choose from when you get to their Amazon page. Are the stakes metal or plastic? They are made out of a very sturdy plastic.